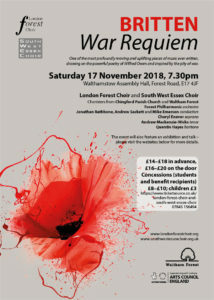 Commissioned in a commemoration of the 100th anniversary of Armistice Day by the London Borough of Waltham Forest, London’s Borough of Culture in 2019 and performed to a sell out audience. Excerpt from a review of the concert by Dr Kenneth Pickering, honorary Professor of drama and performance, University of Kent. Read the full review here in East London and West Essex Guardian newspaper here.